Simple answers for simple minded. We discussed the I35 bridge collapse in the latest audio. I didn’t really follow the story, but this latest piece of information I found at 3:00 in a 9/11 video has me convinced that this too was a simple controlled demolition of a blocked off bridge. Add vicsims and you have a great excuse to jack up gas taxes and pay for a new bridge, without anyone daring to question the rationale. Why? Because we are told that a piece of metal, a gusset plate, was too weak to support the extra construction vehicles on what was likely an over-engineered bridge (like all have to be) and caused the bridge to collapse. So sure are they that a small (relatively) plate caused a massive bridge to collapse that it earned a place in a museum. They wouldn’t lie if it placed in a museum, would they? (think 9/11, dinosaurs if unsure) If you believe a simple set of plates was enough to let a whole bridge fall into a river, then you’ll believe a Canadian truck whacking an overhead beam was enough to do the same. Patently absurd. Where are A&E on this issue? Reminds me of a certain O ring that was faulty in another phony event, the Challenger disaster. To think that if this a genuine event, which it was not, could be blamed on a leaking seal, with all its over engineering, shows how those that make these hoaxes think the public is plane stupid. Of course, the official story of why WTC7 collapsed was burning office furniture – not even the diesel tanks we were told were in the building for the generators. One of the key elements that caused the Interstate 35W Bridge to collapse is now on display in Minneapolis. It comes less than a week before the 10-year anniversary of when the bridge fell. 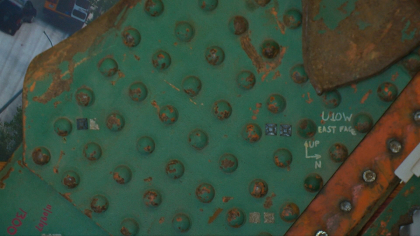 A metal gusset plate was identified as the first piece of the bridge to fail when it collapsed on Aug. 1, 2007. This entry was posted in #HRDPAR on June 24, 2018 by ab. Alvarez pops up everywhere in the alchemists’ world. He should be more famous than Einstein when it comes to the public perception of genius – genius to make fiction fact.